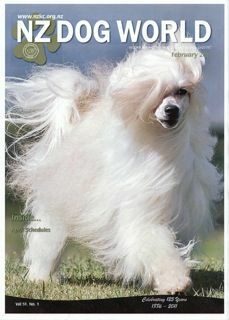 SaTaMu Kublai Khan - Selected for the cover of the New Zealand Kennel Club magazine! What an honour! SaTaMu Ghengis Khan and SaTaMu Green Dragon selected to illustrate one of the articles in the New Zealand Kennel Club magazine! 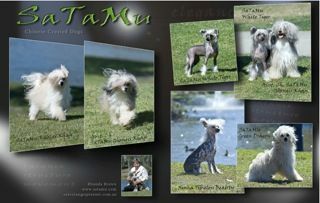 "History of the Chinese Crested in Australia"
Sa'TaMu consists of Rhonda Brown and my fun and gorgeous Chinese Cresteds and one Rottweiler, who unfortunately believes she is a Crested. My dogs are part of my family. They live with me in my home, not in kennels. I show my dogs sparingly and breed occasionally. I have been involved with the amazing and wonderful Chinese Cresteds for over 15 years. During this time I have learnt so much from some wonderful mentors. There is still so much to learn. It is a never ending processess in the aim to better my breed, one I enjoy. I am constantly researching cresteds world wide to improve my 'eye' for a quality crested and looking for quality kennels. This search has led me to a select few kennels that have assisted in my improvement of Sa'TaMu Chinese Cresteds. Ch Lohamras Laiza Lemonad (Int Ch Lohamras Dukat v Int Ch Prefix Hotlips). Haze, Ch Prefix Smoke on the Water, now lives permanently with me here in Queensland. Sally, thank you so much, I love my 'little Hazel'. My aim to is breed healthy Chinese Cresteds that come as close the standard as possible. Structure, balance, movement (reach and drive) and elegance - quality Chinese Cresteds! To this end my dogs are prcd PRA tested, Ophthamologist Tested, hip and elbow scored and patella tested. I currently have four generations of Cresteds that have been health tested with 'clear' results. Most people look for a dog that will fit into their homes and lifestyle - I look for a home that will suit my cresteds, they need to be dearly loved and cared for by people who are able to make them happy. The health testing of my cresteds means that they have a much lower risk of developing genetic problems, such as luxating patellas or blindness. Sa'TaMu Chinese Cresteds exclusively uses Animal House grooming products. "I care, therefore I health test"